Whomp whomp. 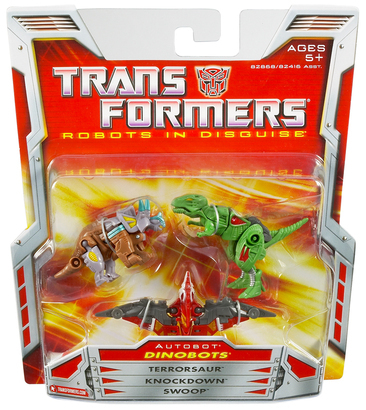 There're no Dinobots: Terrorsaur & Knockdown & Swoops for sale. Mini-con three pack of the Dinobot Team! I'm not a huge Mini-con fan, but I do love robot dinosaurs! These little guys are fun to play with, but really, only the alt-modes are really satisfying. The robot modes are unique, but I only found Terrorsaur's to be anything beyond "weird folded up animal". The beast modes are great. Unfortunately, the transformations are a bit awkward and the robot modes look terrible. Terrorsaur's t-rex head splits in half, and each half is used as an arm in robot mode. It looks ridiculous.